A tunnel boring machine (TBM) also known as a “mole“, is a machine used to excavate tunnels with a circular cross section through a variety of soil and rock strata. They can bore through hard rock, sand, and almost anything in between. Tunnel diameters can range from a metre (done with micro-TBMs) to almost 16 metres to date. Tunnels of less than a metre or so in diameter are typically done using trenchless construction methods or horizontal directional drilling rather than TBMs. Tunnel boring machines are used as an alternative to drilling and blasting (D&B) methods in rock and conventional ‘hand mining’ in soil. TBMs have the advantages of limiting the disturbance to the surrounding ground and producing a smooth tunnel wall. This significantly reduces the cost of lining the tunnel, and makes them suitable to use in heavily urbanized areas. The major disadvantage is the upfront cost. TBMs are expensive to construct, and can be difficult to transport. 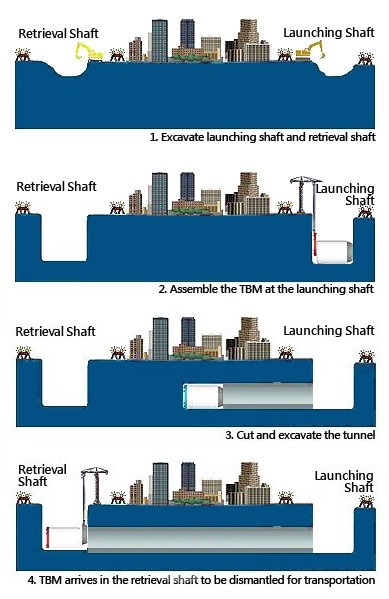 However, as modern tunnels become longer, the cost of tunnel boring machines versus drill and blast is actually less—this is because tunnelling with TBMs is much more efficient and results in a shorter project. The largest diameter TBM, at 15.43 m, was built by Herrenknecht AG for a recent project in Shanghai, China. The machine was built to bore through soft ground including sand and clay. The largest diameter hard rock TBM, at 14.4 m, was manufactured by The Robbins Company for Canada’s Niagara Tunnel Project. The machine is currently boring a hydroelectric tunnel beneath Niagara Falls, the machine has been named “Big Becky” in reference to the Sir Adam Beck hydroelectric dams to which it is tunneling to provide an additional hydroelectric tunnel. In hard rock, either shielded or open-type TBMs can be used. All types of hard rock TBMs excavate rock using disc cutters mounted in the cutter head. The disc cutters create compressive stress fractures in the rock, causing it to chip away from the rock in front of the machine, called the tunnel face. The excavated rock, known as muck, is transferred through openings in the cutter head to a belt conveyor, where it runs through the machine to a system of conveyors or muck cars for removal from the tunnel. Open-type TBMs have no shield, leaving the area behind the cutter head open for rock support. To advance, the machine uses a gripper system that pushes against the side walls of the tunnel. The machine can be continuously steered while gripper shoes push on the side-walls to react the machine’s forward thrust. At the end of a stroke, the rear legs of the machine are lowered, the grippers and propel cylinders are retracted. The retraction of the propel cylinders repositions the gripper assembly for the next boring cycle. The grippers are extended, the rear legs lifted, and boring begins again. The open-type, or Main Beam, TBM does not install concrete segments behind it as other machines do. Instead, the rock is held up using ground support methods such as ring beams, rock bolts, shotcrete, steel straps, and wire mesh (Stack, 1995). In fractured rock, shielded hard rock TBMs can be used, which erect concrete segments to support unstable tunnel walls behind the machine. Double Shield TBMs are so called because they have two modes; in stable ground they can grip against the tunnel walls to advance forward. In unstable, fractured ground, the thrust is shifted to thrust cylinders that push off against the tunnel segments behind the machine. This keeps the significant thrust forces from impacting fragile tunnel walls. Single Shield TBMs operate in the same way, but are used only in fractured ground, as they can only push off against the concrete segments (Stack, 1995). In soft ground, there are two main types of TBMs: Earth Pressure Balance Machines (EPB) and Slurry Shield (SS). Both types of machines operate like Single Shield TBMs, using thrust cylinders to advance forward by pushing off against concrete segments. Earth Pressure Balance Machines are used in soft ground with less than 7 bar of pressure. The cutter head does not use disc cutters only, but instead a combination of tungsten carbide cutting bits, carbide disc cutters, and/or hard rock disc cutters. The EPB gets its name because it is capable of holding up soft ground by maintaining a balance between earth and pressure. The TBM operator and automated systems keep the rate of soil removal equal to the rate of machine advance. Thus, a stable environment is maintained. In addition, additives such as bentonite, polymers and foam are injected into the ground to further stabilize it. In soft ground with very high water pressure and large amounts of ground water, Slurry Shield TBMs are needed. These machines offer a completely enclosed working environment. Soils are mixed with bentonite slurry, which must be removed from the tunnel through a system of slurry tubes that exit the tunnel. Large slurry separation plants are needed on the surface for this process, which separate the dirt from the slurry so it can be recycled back into the tunnel. While the use of TBMs relieves the need for large numbers of workers at high pressures, a caisson system is sometimes formed at the cutting head for slurry shield TBMs. Workers entering this space for inspection, maintenance and repair need to be medically cleared as “fit to dive” and trained in the operation of the locks. Behind all types of tunnel boring machines, inside the finished part of the tunnel, are trailing support decks known as the back-up system. Support mechanisms located on the back-up can include: conveyors or other systems for muck removal, slurry pipelines if applicable, control rooms, electrical systems, dust removal, ventilation and mechanisms for transport of pre-cast segments. Urban tunnelling has the special challenge of requiring that the ground surface be undisturbed. This means that ground subsidence must be avoided. The normal method of doing this in soft ground is to maintain the soil pressures during and after the tunnel construction. There is some difficulty in doing this, particularly in varied strata (e.g., boring through a region where the upper portion of the tunnel face is wet sand and the lower portion is hard rock). TBMs with positive face control, such as EPB and SS, are used in such situations. Both types (EPB and SS) are capable of reducing the risk of surface subsidence and voids if operated properly and if the ground conditions are well documented. When tunnelling in urban environments, other tunnels, existing utility lines and deep foundations need to be addressed in the early planning stages. The project must accommodate measures to mitigate any detrimental effects to other infrastructure. The basic principle of this TBM is to maintain the face pressure during the excavation phase by filling the working chamber, located behind the cutter head, with slurry. Limits ground settlement and produces a smooth tunnel wall. This significantly reduces the cost of lining the tunnel, and makes it suitable to use in heavily urbanized areas. The major disadvantage is the upfront capital cost. TBMs are expensive to construct, difficult to transport, require significant backup systems and power. Typical Performance – 5m to 30m per day. Actual performance and costs will depend on ground conditions and tunnel diameter. 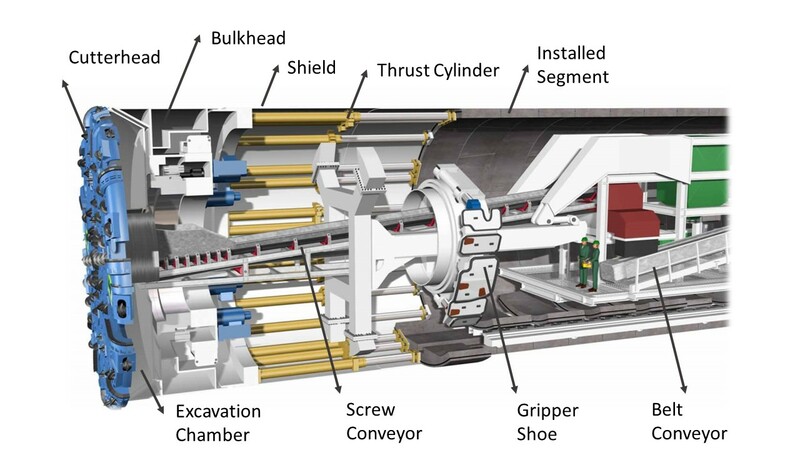 This is a mechanised tunnelling method in which spoil is admitted into the tunnel boring machine (TBM) via a screw conveyor arrangement which allows the pressure at the face of the TBM to remain balanced without the use of slurry. Tunnel Lining – Precast Concrete Segments. Typical Performance – 9m to 35m per day. Actual performance and costs will depend on ground conditions and tunnel diameter. This method involves the use of a Tunnelling machine with a shield and cutter head suitable for hard rock. They offer a continuous and controlled means of tunnelling capable of high rates of advance under favourable conditions. Their applicability is limited to long tunnels where the high rates of advance and tunnel quality can offset their high capital cost. Typical Performance – 12m to 67m per day. Actual performance and costs will depend on ground conditions and tunnel diameter.